Anxiety disorders are the most frequently seen mental disorder in general practice and generalised anxiety disorder (GAD) is one of the most common types. GAD is often seen in people who also have major depression. Psychological and drug therapies are equally effective in the treatment of GAD but the relapse rate for psychological therapies may be lower. Selective serotonin re-uptake inhibitors are the first line option for drug treatment of GAD. Which anxiety disorder is most likely? An algorithm can be used to determine which anxiety disorder is most likely (Figure 1). The DSM-IV diagnostic criteria are used for a formal diagnosis of GAD (see below). 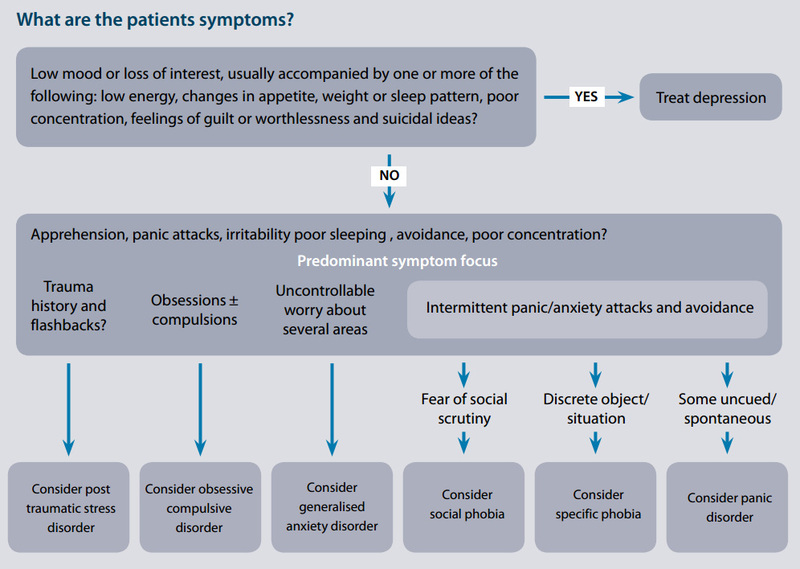 The Generalised Anxiety Disorder Scale (GAD7, Figure 2) can be used to assess severity. Excessive anxiety and worry about a number of events or activities, occurring more days than not for at least six months, that are out of proportion to the likelihood or impact of feared events. The anxiety, worry or physical symptoms cause clinically significant distress or impairment in social, occupational or other important areas of functioning. Treatment is indicated for most people with GAD. Less intensive interventions are required for those with fewer or less severe symptoms. Self-directed cognitive behavioural therapy programmes have been shown to be effective.12 Programmes such as MoodGYM and E-couch are available online and contain modules, anxiety and depression assessments and interactive games and other activities, aiming to teach people cognitive behavioural techniques. For drug doses see Table 1. First line drug treatment of GAD is an SSRI as they are generally well tolerated and can be used long term without the risk of tolerance or abuse.1,7 As there is likely to be a class effect of SSRIs in treating anxiety disorders, the choice of a particular SSRI can be based on potential adverse effects, interactions and patient preference.9 SSRIs are also effective in treating depression that can commonly co-exist with anxiety. Panic attacks are unexpected discrete periods of intense fear or discomfort. Typically panic attacks reach their peak within ten minutes and last 30–45 minutes. Often patients may feel that they are experiencing a serious medical condition such as a myocardial infarction. Panic disorder is characterised by recurrent panic attacks. About two-thirds of people with panic disorder develop agoraphobia. This is a fear of being in places or situations from which escape might be difficult should a panic attack occur, including being in a crowd, being outside the home or using public transport. Social phobia is characterised by marked, persistent and unreasonable fear of being observed or evaluated negatively by other people in social or performance situations e.g. speaking to unfamiliar people, eating in public. Post-traumatic stress disorder develops after exposure to an event causing psychological trauma e.g. actual or threatened serious injury to self or others. The condition is characterised by recurrent and distressing recollections of the event, nightmares and/or a sense of reliving the experience with illusions or hallucinations. People often make efforts to avoid activities or thoughts associated with the trauma. Hyper-arousal symptoms such as disturbed sleep, hypervigilance and an exaggerated startle response are also associated with PTSD. Obsessive-compulsive disorder is characterised by recurrent obsessions and/or compulsions that cause impairment in terms of distress, time or interference with functioning. Common obsessions relate to contamination, accidents and sexual or religious preoccupations. Common compulsions include washing, checking, cleaning, counting and touching. Thank you to Professor Tony Dowell, Head of Department, Primary Health Care & General Practice, Wellington School of Medicine, University of Otago, Wellington for expert guidance in developing this article. Baldwin DS, Anderson IM, Nutt DJ, et al. Evidence based guidelines for the pharmacological treatment of anxiety disorders: recommendations from the British Association for Psychopharmacology. J Psychopharmacol 2005;19(6):567-96. The MaGPIe Research Group. The nature and prevalence of psychological problems in New Zealand primary healthcare: a report on Mental Health and General Practice Investigation (MaGPIe). N Z Med J 2003;116(1171 ). New Zealand Guidelines Group (NZGG). Identification of common mental disorders and management of depression in primary care. An evidence-based Best Practice Guideline. Wellington: NZGG, 2008. Gale C, Davidson O. Generalised anxiety disorder. BMJ 2007;334:579-81. Bandelow B, Zohar J, Hollander E, et al. World Federation of Societies of Biological Psychiatry guidelines for the pharmacological treatment of anxiety, obsessive-compulsive and post-traumatic stress disorders - first revision. World J Biol Psychiatry 2008;9(4):248-312. Canadian Psychiatric Association. Management of Anxiety Disorders. Can J Psychiatry 2006;51(Suppl 2). Kavan MG, Elsasser GN, Barone EJ. Generalised anxiety disorder: Practical assessment and management. Am Fam Physician 2009;79(9):785-91. National Institute for Health and Clinical Excellence (NICE). Anxiety: management of anxiety (panic disorder, with or without agoraphobia, and generalised anxiety disorder) in adults in primary, secondary and community care. London: NICE, 2007. Ciechanowski P, Katon W. Overview of generalised anxiety disorder. UpToDate 2009. Available from: www.uptodate.com (Accessed November, 2009). National Prescribing Service Limited. Which treatment for what anxiety disorder? NPS News 2009;65. Available from: www.nps.org.au (Accessed November, 2009). Dowell A, Garrett S, Collings S, et al. Evaluation of the Primary Mental Health Initiatives: Summary report 2008. Wellington: University of Otago and Ministry of Health, 2009. Christensen H, Griffiths KM, Jorm AF. Delivering interventions for depression by using the internet: randomised controlled trial. BMJ 2004;328(7434):265. Hirsch M, Birnbaum RJ. Sexual dysfunction associated with selective serotonin reuptake inhibitor (SSRI) antidepressants. UpToDate 2009. Available from: www.uptodate.com (Accessed November, 2009). Gale C, Millichamp J. Generalised anxiety disorder. BMJ Clin Evid 2007;11:1002.